Think we can get a kickback for this picture? I think the boys would be excellent spokeskids for a television. 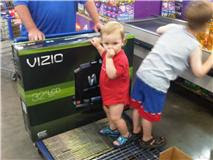 My parents upgraded their TV this evening, and since they were at Sam's -- our favorite place -- the boys and I tagged along. They had a great time riding on this cart in the checkout line. Thankfully, no accidents at Sam's. Baby Plum ran into a door jamb while playing chase with Little Elvis this morning. He's got a line on his cheek, and another knot on his forehead. It goes well with the other two knots that were already there. Little Elvis has scrapes on both knees, one foot, and his shoulder. He's got two bruises on his forehead, and he's got a cracked toenail. And none of these injuries was inflicted by the other brother. Little Elvis has suddenly become my daredevil. He jumps off all of the furniture in the house now. And loves to jump from Daddy's desk chair to our bed. He also is trying to scale the front of my dresser by using the drawer pulls as rock climbing things. There's nothing up there that he can't reach from the floor, but I guess it needs to be done. Baby Plum is doing his best to keep up. Their current favorite playplace? Mommy and Daddy's bed. It's a lot of fun to bounce on, flip on, and jump off of. It's also a great way to shorten my life. I think my reaction to their antics makes it that much more fun.